Pittsburgh, Pennsylvania-based classic metal band AFTERSHOK has unleashed a new video for the track "Forever In Metal". The track comes their most recent studio album, Detonate (Auburn Records). Check out the "Forever In Metal" video on KNAC.COM HERE. 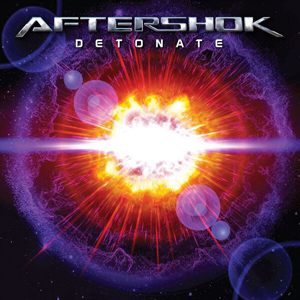 On Detonate, guitarist George Mihalovich and drummer George Borden joined forces with new vocalist Gord Sheffroth from New Brunswick, Canada, to create 13 tracks of modern classic metal. Sheffroth replaces vocalist Vic Hix (SHOK PARIS) who appeared on the band's first two albums, Unfinished Business and Burning Chrome. Detonate was recorded by Jim Dofka at JK Musicians Workshop and mastered by Maor Appelbaum. The cover art and layout design were created by Alex Yarborough.